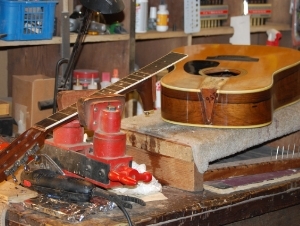 ARC Guitar's Workshop - we take great pride in the quality and value of our work. 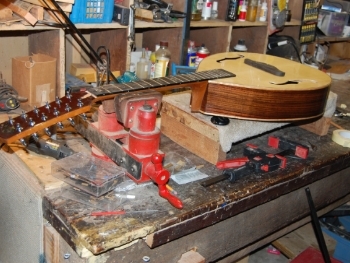 As a result of regular use and years of playing, frets become worn and pitted. 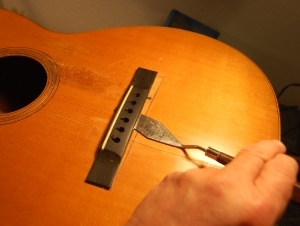 Eventually, the frets need to be removed and replaced. After evaluation, we'll attempt to level, recrown and polish the frets with a Deluxe Set Up ($95.00). 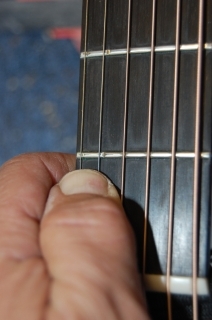 If there is not enough fret height to work with, then a complete re-fret may be recommended. A "Deluxe Set Up" is include in the cost of the refret. The constant string tension between the nut and the bridge can take it's toll. If your guitar is hard to play and there's no room for lowering the height of your saddle, you may need a neck reset. This is an operation where the neck is removed from the body and the neck angle is corrected to insure optimum performance, ease of playablility and increased volume. 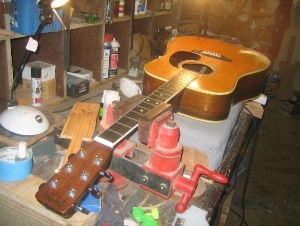 The neck is then re-attached to the body and set up for a lower, more confortable playing action. There's nothing quite as heart-breaking as discovering a broken headstock on your favorite guitar. 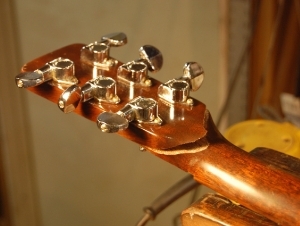 Not all broken headstocks are quite as devastating as the one pictured, but they can be tricky to repair and it may be impossible to make the repair invisible. 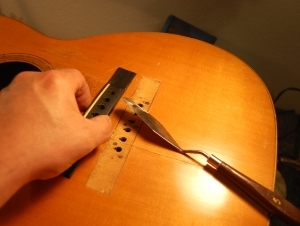 Nonetheless, ARC Guitar can make the crack or break stable by regluing the pieces and by using other reinforcements to insure the crack won't fail. What causes a bridge to come loose? Loose "X" braces, humidity changes and impact damage all contribute to a loose bridge. The bridge must be removed, the area cleaned and the bridge reglued and clamped into the correct position. 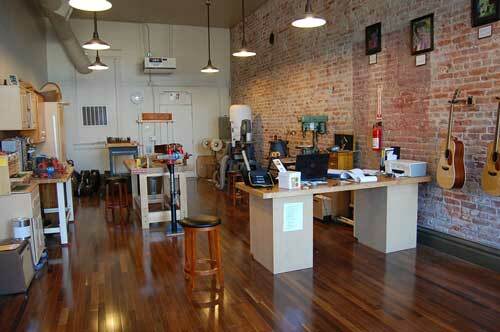 Discounts may be offered for additional work performed. Re-Finish Instrument with Nitrocellulose Lacquer - $500.00 min.